With the aid of our MANDO Adapt 215 segmented mandrel, you can quickly change to perfect I.D. clamping. You'll be surprised how accurate you can clamp and how well you can machine your work pieces. Concentricity of less than 10 µm can be achieved. The face of the MANDO Adapt is precision ground for precise adaptation. Exact center alignment is accomplished via the patented CENTREX system. With this chuck you will be able to tackle most applications while your competitors are still changing chucks. 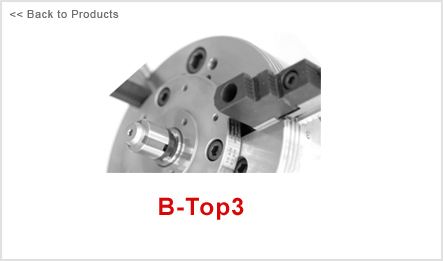 And what is really revolutionary is the fact that you can also mount a SPANNTOP chuck, the SPANNTOP Adapt 215, onto the B-Top3 and can benefit from the undisputed advantages of this system - for the right parts simply ideal. You have never turned like this before, have you? Three in one: Combine the B-Top3 – a version of the B-Top chuck – with SPANNTOP Adapt 215 and our segmented mandrel MANDO Adapt. And all without taking the jaw chuck of the machine.